The Honor 7X is this year’s Honor mid-range flagship device. One that has an incredible hardware build that’s selling for $250 in the US. The handset launched with EMUI 5.1 based on Android Nougat and the company promised an Oreo + EMUI 8.0 update some time in Q2. 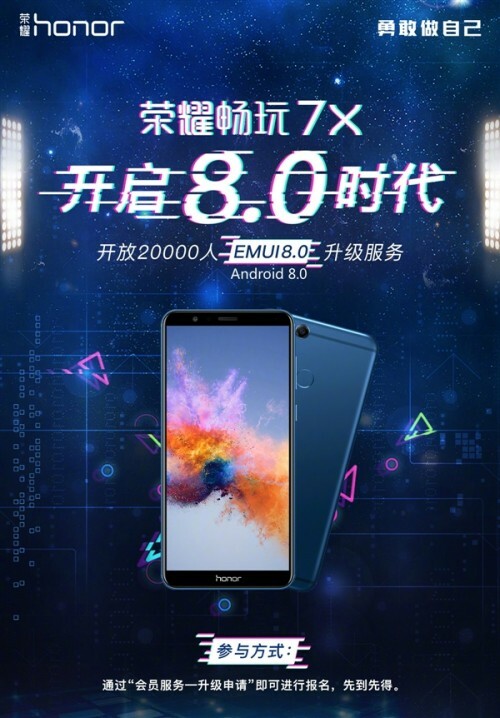 The latest report from news firm My Drivers stated that Honor officials confirmed that the Honor 7X’s stable release of the EMUI update is well into development will begin rolling out in May. The new EMUI 8.0 update brings new AI derived features which can predict some user behavior and make the phone feel quicker. RAM is also compressed and memory is continuously defragged in order to keep performance lean and efficient. Users will definitely see less stutter with the update. The company has opened up 20,000 spots for users to be among the first ones to receive the stable update – though this only seems to be the case for the Chinese version of the ROM. Those with the Global or North American versions of the ROM that signed up for the Beta will likely be the first ones to receive the stable build OTA. Thanks for sending this in, Manuel! No. What kind of question is that??? Indian honor 7x also get oreo update?